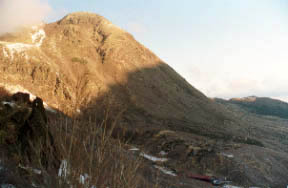 They are Mt. 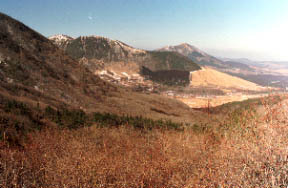 Kuju and an inside mountain to a Mt.Mimata and the left in the hokkein hot spring from a Bougatsuru, and the right. 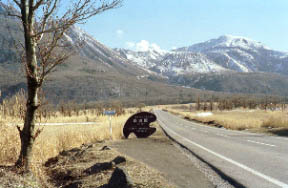 The mountains hot spring which goes a mountain trail over on foot about 2 hours, the Kujyu mountain range seen from a trailhead Choujyabaru first of all. 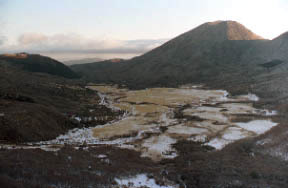 A Bougatsuru is moved in a zigzag direction and they are the flow Naruko river origin and a mountain in the Kyushu mainland highest peak 1791m. 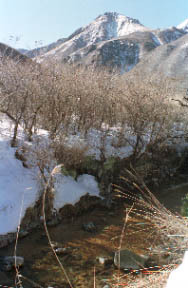 It is a hokkein hot spring from an inside mountain mountain trail to a Mt.Mimata and the right hem.